I don’t think I can accurately describe just how much I love this book, but I will try. It had me hooked from the start, grabbing me instantly with the strong, smart, vulnerable women, and kept me hooked through the entire story. The relative lack of men was an added, welcome, and refreshing change of pace from most books I’ve read. 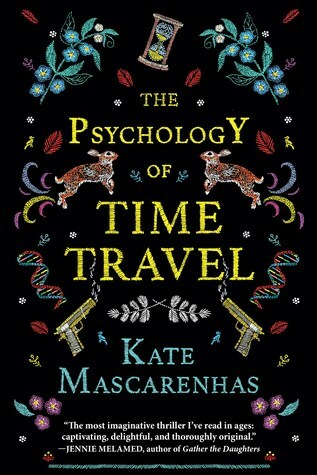 I’ve also noticed that most books and movies/television shows involving time travel make the reader/viewer do some mental gymnastics in order to wrap their head around the whole concept, however Mascarenhas does all that for you, leaving your brain free to try to dissect the murder mystery. I also loved how the story is woven together and how organized it is, despite it being about a very disorganized subject. This made it easy to read and impossible to put down. I have already started telling all my friends about this book and will continue to bother them until each and everyone of them reads it. I was utterly blown away and loved every minute of it. Review: This book thoroughly boggled my brain. The concept of time travel makes absolutely zero sense to me. This book is technically a murder mystery, but oddly it didn’t feel to me like a murder mystery at all. The mystery itself became more of a subplot as I struggled to wrap my head around the various concepts detailed in the book pertaining to time chronology, “genies”, and other time travel concepts. I liked the book, but I was honestly too confused by it to love it.